Mr. Jon Bon Jovi spent some time at the White House this morning to meet about summer jobs for youth, but we never saw him to ask him how the meeting went. "Jon is at the White House with @JonCarson44- to tell us about his work with @JBJSoulFound, @Servedotgov and http://wew.serve.gov/council." The White House announced today their new initiative called "SummerJobs+" which is a call for businesses to hire low-income and at-risk youth for summer jobs. The project, launched through the Department of Labor, hopes to create 250,000 jobs by the start of summer, with at least 100,000 of which will be paid jobs and internships, according to a White House statement. 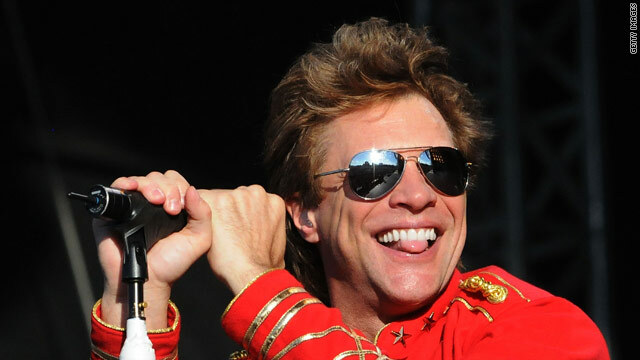 We're still not sure exactly how Jon Bon Jovi fits into the overall initiative but his foundation, the Jon Bon Jovi Soul Foundation based out of Philadelphia has the goal to "'recognize and maximize the human potential in those affected by poverty and homelessness by offering assistance in establishing programs that provide food and affordable housing while supporting social services and job training programs," according to the group's website. There's no word on if he made a quick stop in the Oval Office while he was here. How about Bon Jovi helping to get NJ and Philly miniority kids employed for the summer up and down the Jersey shore? There are thousands of Russian, Irish and Eastern European kids who come here each summer, working 2 full time jobs, 7 days a week, so thankful to have a chance to make money. We dont need another Washington program. We need a local work ethic. Where is Barry Sotero when you need him! Hey BJ, you can start helping the US by paying your "fair share" of taxes.....hypocrite. And you can tell your buddy Springsteen to do the same. Yes You Can do most the math in your head! Jon Bon Jovi? I heard he was dead. I'm getting upset by these comments. JBJ has done more for charity than any person I know except for Oprah, and he even gave one million to Oprah's charity. He is a man of integrity and I respect him immensely. He is a law abiding citizen and he is giving back to society, especially with the Soul Foundation, more than any of you people out there that are critizing him. So all I gotta say is, "Shut up and do what he does"!" You try donating a million dollars to charity! You try to build hundreds of apartments and give them to the homeless! You try to open up a restaurant where you can get a meal by just washing the dishes afterwards if you do not have the money to pay! You go JBJ!!!! I love you and I admire you and I wish more people could be just like you! summer jobs? How about REAL jobs...obama cuts the military and defense industry and he is going to create summer jobs for children....where is this guys brain? Dang Man!!! Pay attention you know dang gone well Republicans have blocked evrey jobs bill that been proposed. Stop drinking their kool-aid and talking their talking points. They are for the 1% not the 99%. thank God obamas job plan was blocked... a half trillion dollar tax reduction and spending...wow! Pure insanity lowering SS tax contributions when the program is underfunded as it is. And increase taxes to just higher earners...this won't solve any problems...obama has no real interest in doing anything of value...except to play games to get reelected. Sorry Jerry but the republicans said NO to Obama's job plan – remember? @Jerry. What have YOU done to help America create jobs? ...and before you ask, I have done my part by volunteering to help educate Americas youth (regardless of their economic status) on preparing for a bright future. I bet the ones taking those summer jobs will be grateful! ...Again Jerry, what have you done? does this guy have AIDs? How is it he got in the while house? Oh...this is an election year...I get it....bring your cash, yes, you to mr Devil. JBJ has done great things for the homeless and needy all across the United States. People give him a bad rap because of his music, which I think is great. If you give it a chance and listen to his message in his music you would see it encourages people to fight for your dreams and never give up. Again, the people who bash him have not taken the time to do the research on what he has accomplished for America. His foundation doesn't care if you are black, white or purple. I'm sure he pays a lot more taxes that any of you complainers and then does great things for charity. All the people who sit back and complain need to look in the mirror and ask yourself "What are you doing to make the United States of America a better place to live"... other than complain. You need to shut up and put you time and effort in helping your fellow Americans. Try a positive attitude, do your research before you bash the people who ARE making a difference, and help instead of being a cronic complainer of what other people are trying to do. Attractive element of content. I just stumbled upon your blog and in accession capital to assert that I acquire actually enjoyed account your weblog posts. Any way I will be subscribing to your feeds and even I achievement you access persistently rapidly.